Rewards – TOP-DESIGN CHWASZCZYNO Sp. J. A letter of appreciation for actively supporting activities in the field of fire-protection. 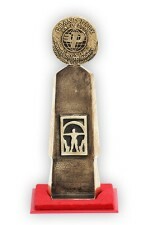 "MERIT FOR AGRICULTURE", THE MEDAL AWARDED DURING THE GENERAL ASSEMBLY OF THE NATIONAL POLISH ASSOCIATION OF THE MANUFACTURERS OF THE FIRE-PROTECTION MEASURES AND RESCUE EQUIPMENT, TO THE CO-OWNER OF THE COMPANY, FELIKS CHUDZYŃSKI, BY THE MINISTER OF AGRICULTURE AND RURAL DEVELOPMENT, WOJCIECH OLEJNICZAK. Let us remind that in the Catalogue (issue 10), in the section: Manuals, there are two new chapters, referring to HACCP and also agriculture, including work-safety manuals, procedure, hygiene etc. in accordance with the guidelines in the Directive of the European Union. "On behalf of the inhabitants of Gdańsk and all the Poles, for whom the memory of the ideas of August 1980 is of importance, I would like to express my gratitude for you for the work contributed to the organization of the twenty-fifth anniversary of the formation of Solidarity. It is thanks to your effort that Gdańsk has once again been on the mouths of the Poles and Europeans. These days of August were a major challenge for all of us. I am convinced that our joint efforts made it possible to emerge victoriously from this trial."